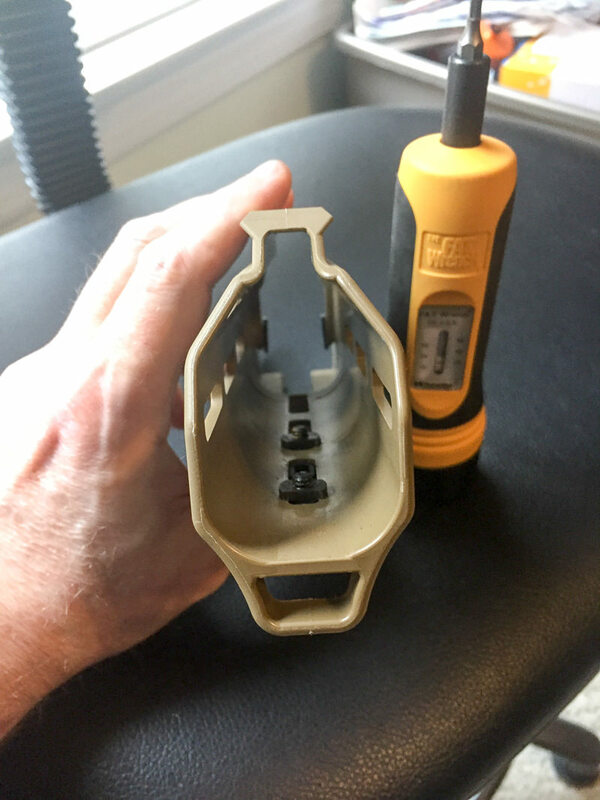 Looking at the two photos you have, One it looks like the MDR has a shorter length of pull and in the second one it looks like it has a longer length of pull. so I am confused which one is the shorter LOP rifle, dang out I hate optical illusions. Good point. Will just measure both tomorrow... Was going to wait for the pic with AUG until after mounting the optic but thought it was an interesting pic so took a quickie potato pic. I'm probably going to get a Rugged Surge. Great muzzle devices and has a K configuration built in. I have both the surge and razor, find myself using the razor more. Both are good. Thinking about getting a sandman s next. LGS has amtacs on sell, but with all the mdr problems think I will stick with qd cans for now. Measured both the AUG and MDR LOP - charged/trigger reset in straight line to rear of stock center is pretty near identical at ~15" to end of buttstock. A Q Trash Panda or Thunder Chicken is a better choice, especially for a platform that is sensitive to back pressure. 1. There is in fact locking compound on the screws (my prior 3 slot MII still has Loc-Tite on it, but anyways ... ). 2. Torqued to 15 in/lbs, which is the spec for MLok polymer to polymer mounting. 3. MLok backers are as they should be. I also swapped the Aero Precision mount for a Spuhr. Unfortunately, the weather wasn't cooperating for this weekend, but should be back to the range next Sat with it. That Spuhr mount makes me jealous. With eBay's 20% off sale last night or the night before I was this close >< to buying a Spuhr mount for my ssg08. If you still have the aero mount and don't need it, let me know. May have a use for it in an AR... Will email you later. Sounds good. I picked up the Spuhr on a 25% off from OP. Of course it took forever to show up but worth it for the price break. Depending on how next weekend goes, I may throw on the Deltapoint Pro onto the Spuhr and do a 2/3 gun match for grins. Totally missed the eBay sale or I might have picked up a second Spuhr. Rtp...that scope though. On my wish list for sure. Speaking of mounts and such, are you finding that you need higher mounts for the optic than if you were using it on an AR? No. Tried shorter when I used the ERS off my 700 and it was way low. Unlike the Tavor, MDR is good to go with AR height mounts. Thanks! I had a cheap VISM ECO (don't ask...it looked cool, it was late at night, and it was dirt cheap on Dvor...) that's been sitting on the shelf for well over a year and tried it out and had to crane my head down to see through it. The best thing about the scope is the green laser...that is bright...but the rest of it...meh. Bushnell is doing 30% off this month. Puts that dmr/hdmr down in the 1000-1100 range. Also no limit so xrs in the 1500 range. I was initially concerned about this as well, moreso as I jumped through some hoops with a buddy with his Tavor where we had to squish our faces into the stock for a 'nose-weld' to get a decent sight picture, but AR mounts seem to be spot on. My Spuhr is right at 1.5" IIRC. This is supposed to exclude the Elite Tactical line, but get it if you're able to. 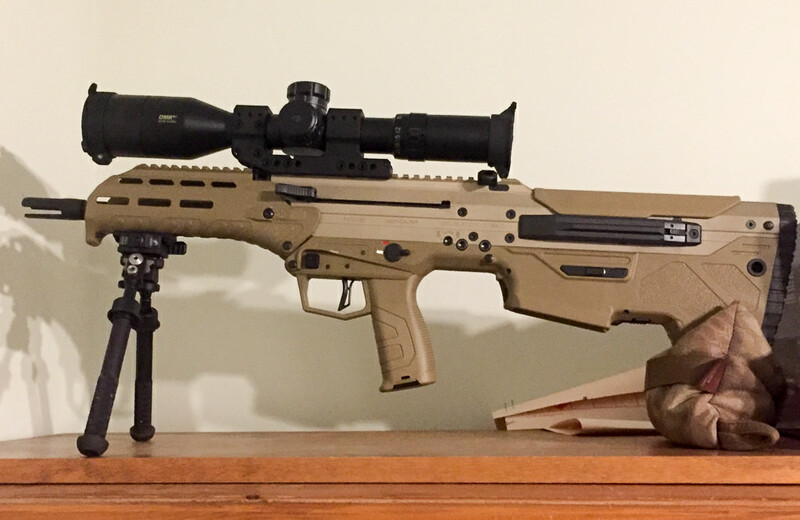 I got a nice deal on the DMR2, so not concerned, although were the XRS2 out and available for a similar discount I likely would have picked one up, even if it wound up on the bolt gun and the ERS came over to the MDR. One interesting thing is supposedly a DMR2 'Pro' with ED glass is supposed to be coming at some point in the future, as well. Rtp thanks for that catch. Some web sites were showing the rebate on the dmr and xrs. I bought a Primary Arms Platinum 6-30x56mm with a 34mm main tube for a Ruger Precision Rifle. The tracking is perfect... I mean spot on! I shot it out to 600 yards dialing and redialing out to various ranges throughout the day with great results. I dialed it down to the 100 yard zero stop at the end of the day and it shot exactly to its original zero. It’s a mil on mil scope meaning it dials and reticle ranges in mils. Some scopes dial in mils yet their range finding is in MOA which makes no sense. It’s a first focal plane scope with HD glass and it’s also made in the same exact factory as $3000+ scopes. It uses the same components at half the price. People should take a good look at it for a best value scope. You get a military grade HD scope with an AMAZING DECA reticle for around $1500. You could throw a big name sticker on it and sell it for $2500 or more all day long. The Bushnell tracks nice but they use lower end glass. There is an article somewhere online where one of the designers admits to using lower end HD glass. There was a reason but I forget what it was. Check out some user reviews online and on YouTube. I did a ton of research and chose the Primary Arms because it’s tough, crystal clear, and tracks. YouTube long range teacher and shooter Tiberius Rex did a year long test between the Primary Arms, Nightforce, and Vortex HD Gen 2. The Primary Arms was the only scope that didn’t break or get damaged after a year of sub arctic to hot desert testing. I guess Vortex are like disposable lighters, they break all the time but Vortex has the best warranty around and they usually just send out a replacement. They purposely Jack up the cost of their scopes to cover their warranty policy. The Bushnell tracks nice but they use lower end glass. There is an article somewhere online where one of the designers admits to using lower end HD glass. There was a reason but I forget what it was. Check out some user reviews online and on YouTube. I did a ton of research and chose the Primary Arms because it’s tough, crystal clear, and tracks. YouTube long range teacher and shooter Tiberius Rex did a year long test between the Primary Arms, Nightforce, and Vortex HD Gen 2. The Primary Arms was the only scope that break after a year of sub arctic to hot desert testing. Depends on which Bushnell. ERS > HDMR (gen 1) while (H)DMR gen 2 got a glass upgrade over the first gen, and the XRS2 is holding it's own against much more $ optics from initial reports. The DMR 2 'Pro' is supposed to use ED glass - will be interesting to see what happens when it's out. Meanwhile Nighforce, as an example, has 'OK' glass in NSX, while the new 1-8 ATACR is supposed to be quite nice. Pick your compromises and go for it, IMO.